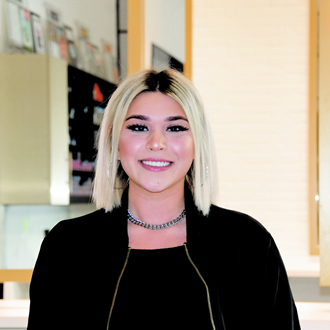 This Northern Virginia native got her start in the beauty industry early on, growing up around an entire family of hair stylists. When it was time for her to go to school, she knew exactly what path she wanted to take and headed for the Paul Mitchell School in Tysons Corner, VA. After completing her education, Natasha has worked to gain her share of official industry experience, assisting experienced stylists, building client relationships, and assisting with day-to-day salon tasks. Outside of the salon, Natasha loves to exercise her creativity and sense of adventure. Between making jewelry, traveling, and going to concerts, living a life full of color and passion is what fuels her and keeps her feeling her best. She is very much “in a growth mindset” and we can’t wait to see where life takes her!